When the weather outside hits the minus scale and going out just seems so frightful, then it is time to wrap up, hunker down, and eat some hearty, filling, and warming foods. Nothing fits this bill quite so well as this hearty winter root soup that's guaranteed to have you tingling from head to toe. The heartiness in the soup comes from the use of root vegetables for filling you up and giving you added vitamins so needed when sunlight is scarce. You can also add in a few winter greens such as kale or florets of broccoli to ring the changes. The soup is so thick it could almost be mistaken for a vegetable stew. If you would prefer a stew, just use a little less stock. Add the carrots, celery, and your chosen root vegetables to the pot, give them a good to stir to mix in the onions and garlic. Raise the heat to medium and cook for 5 minutes. Stir in the tomatoes, raise the heat high and add the stock. Bring the soup up to a gentle boil then lower the heat to keep it so and cook until the root vegetables are cooked through but not breaking up. At this point you can turn the soup off the heat and finish the soup when you are ready to eat if needed. If the soup is cold, bring the soup back to a boil, add your chosen pasta shapes and cook as directed on the packet. Taste the soup and add a little salt and pepper to taste remembering you will be adding Parmesan at the end, so go easy. 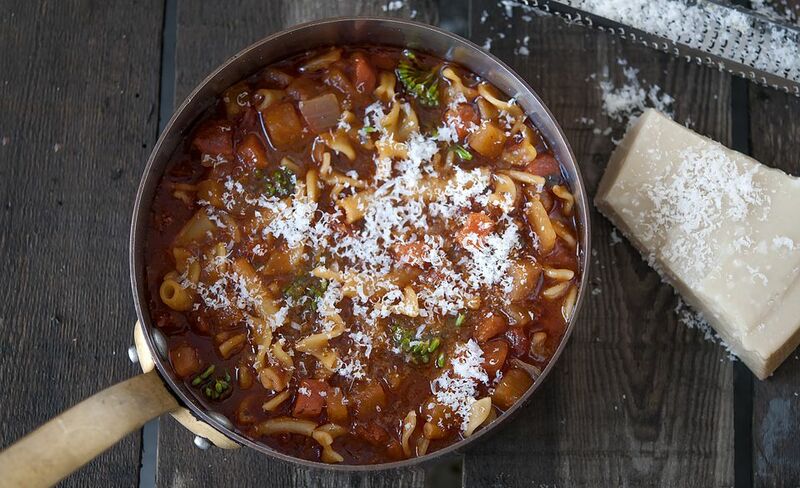 Serve in soup bowls, sprinkled with the finely chopped parsley, freshly grated Parmesan, and a drizzle of fruity olive oil, alongside some crusty bread. We don't recommend serving hot soup into cold bowls, otherwise the soup will be too cool when served. Instead, warm your bowls up first in your oven. The most common way to warm bowls is to put them in a 140 F oven and let them warm for 15 minutes. Please make sure that you use oven mitts when removing them from the oven, because they WILL be hot.